Hey guys, welcome to my SociJam Review and custom bonuses. 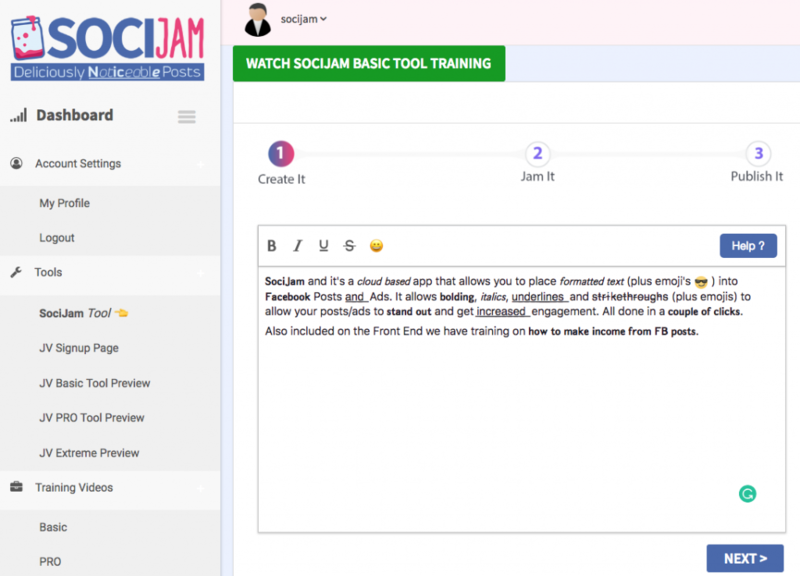 In this review, I will show you exactly what SociJam is and why it is such a powerful tool. Keep in mind that when you buy through this SociJam review, you will also get the bonuses listed below this article. In this Socijam review, you will notice that it is a powerful Facebook tool that you can use to create posts that stand out. As you probably know, Facebook only allows you to enter flat content to its editor. This way it’s very hard to create posts that stand out. I personally use Fb a lot for my online marketing, and I’m always searching for ways to make my posts as attractive as possible. The only way we are able to do that its to use Capitals, some “*” signs and the emojis that Facebook offers. Another way to create attractive posts is to is to design an image in Photoshop and add your content in the image. The downside of this is that the algorithm does not like to see text in images which will result in fewer impressions on your friend’s timelines (see source). FB wants you to be social, and to be social, one of the best ways to get organic reach is to make text posts. Text posts can be made two ways: with or without a colored background. The downside for a post with a colored background is that it only allows you to use a certain amount of characters. So now the question is still there:”How to create posts that stand out?”. That’s where SociJam comes in place! SociJam allows you to do exactly what is missing with the default options of the normal editor. How? 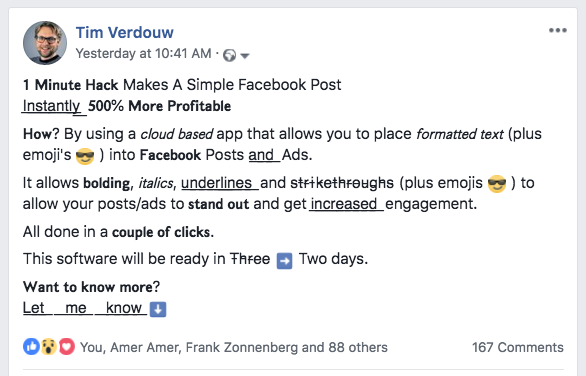 By giving you a cloud-based app that allows you to place formatted text (plus emoji’s 😎) into Facebook Posts and Ads. It allows bolding, italics, underlines and s̶t̶r̶i̶k̶e̶t̶h̶r̶o̶u̶g̶h̶s to allow your posts/ads to stand out and get increased engagement. All done in a couple of clicks! Look at the example post below how much more eye-grabbing a post is which is formatted with Socijam. Also, notice how much engagement I got! As you can see, this post is one day old and I got 88 likes and 167 comments. As you can see it works! If you look at my review video, you will see how easy it is to create posts like the example above. You only need a few clicks and you’re done. Why should my posts stand out? I don’t think this question is hard to answer. When your posts stand out you simply get more engagement which means more sales as a marketer. I myself use Social Media to make sales. From Social media, I drive people to my websites where they make purchases. SociJam is the perfect solution to get peoples attention to driving tons of people to your website. This can be done through direct linking in your post, but also simply by building engagement. You will notice that people will ask for a link to the things you are offering. It’s not something secret, it was there for “ages” but nobody used it. And that’s why I believe it will be a strong tool to use right now. At this moment not many people have seen posts formatted this way, so it is inevitable that people WILL see your posts. It’s very simple. The only thing you have to do is to login into the cloud-based application. Once you are logged in, you can type straight into the text editor which looks the same as every other text editor. Once you have typed your lines, you simply press the buttons (bold, italic, etc) or use the short keys that you normally also use in a text editor. Once you are done, you click next and the text is copied. The only thing left over is to past it into a Facebook post and you’re done! Now you have a post that stands out, that will get more eyeballs, more interactions and more views to your offers. While testing I discovered a cool thing. Because the text is formatted in a special way, you can also use it on other social media platforms like Youtube. Keep in mind that people also read the descriptions written below a Youtube video. With SociJam you are not only able to post on Facebook but also on Youtube and Google plus! How awesome is that! If you are an internet marketer or you use Facebook to build a strong following, I highly recommend you to pick up your copy of SociJam. It’s unique in it’s kind, it helps you build your business and it’s simply awesome to use. This product gets my 100% approval! In this training video, I’ll personally show you how to get hundreds of likes to your facebook posts. This bonus is highly congruent to SociJam. The more engagement you have, the more sales you will make! The money is in the list right? In this training video, I’ll personally show you how to transform your Facebook friends into subscribers so you can sell to them over and over again. Facebook is one of the best platforms to sell your products. In this training video, I’ll personally show you how to make sales through Facebook withSociJam. When you’re new to affiliate marketing it can be hard to get approved by vendors to promote their product. In this video I will show you how to get approved to be an affiliate so you can start promoting their products. Custom Bonus #5 How to sent affiliate links through Facebook without being blocked or banned. Facebook doesn’t like affiliate links and therefore will block your links and sometimes even your account. Loosing your account is a waste of your valueble time that you have put into your account! In this video, I will show you how to send affiliate links through Facebook without being blocked or banned. I will show you how you can stream to Facebook or record videos with any type of background, overlays etc just like you see in the review video where you see me on top of the screen where I review a product. instead of streaming, you can also record your videos. Helps you generate instant commissions without lifting a finger. A 4 part module that teaches you how to master the most essential factor to generating sales or any commission online, and that is traffic. By being able to master the essential traffic generation tools such as Facebook Ads, Google Ads, Solo Ads and Ad Swaps, you’ll literally be able to drive traffic to your site as easy as the push of a button. A 20-part Facebook marketing ‘HOW TO’ training course with detailed walkthroughs of how to create a stampede of traffic to your Facebook page. Learn to tap into these trends: pay attention to memes, hashtags and popular social networks and adapt what you see in your marketing efforts. A course that will teach you the social marketing plan that is essentially the strategy and the series of steps that you plan to follow in order to take your website or business from a small name or tiny blog; into massive, self-sustaining, professional organization. This is the video will teach you all the skills you need to know about SEO, content marketing, social media and more. This eBook covers the importance of developing high-quality content that is SEO optimized, how to use analytics to continually improve your strategy, create a powerful social media marketing campaign, and discover the best social media platforms for your particular target audience.lt also discusses link building and how to approach it, why guest blogging can be the best way to increase traffic to your site, how to go about finding the right blogs to approach, as well as how to grow your email list and implement an email marketing campaign that will get you results, etc. This is a great tool that I will use (I have the FE)…I am debating on OTO1, looking at it now…I like that you have everything in one place and on one dashboard, easy to navigate and implement. As long as not overused, this is a great way to make your posts stand out! Thanks for the thorough and useful review, Tim! Happy to hear you like it Dave! And yeah, it’s a very nice and clean tool. I personally really like it. It gives you just that extra power to your posts.